Nick Bland’s The Wrong Book tops the list of Most Borrowed Picture Books of 2015 from Cockburn Libraries’ Junior Kindergarten collection. 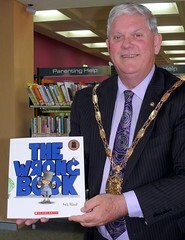 After finishing in second place in 2014, The Wrong Book by Nick Bland finished 2015 as the most borrowed picture book of the year, beating The gruffalo by Julia Donaldson. Another Nick Bland book, The very cranky bear, is the third most popular picture book for 2015, as it was in 2014, and in total Nick Bland has six books in the list, bookending first place with The magnificent tree at #100. Six books is the most by a single author, with Nick Bland‘s six books matched by six of Lynley Dodd’s Hairy Maclary & Slinky Malinki books in the list. Beating those two, however, is Peppa Pig, with 12 books featuring Peppa Pig appearing in the 100 Most Borrowed Picture Books of 2015 list, including Peppa goes to the library. How many of the list have you read (yourself or read to your kids)? Any all time favourites? Any big surprises or shock omissions? Let me know in comments.